Once the Midnight Shopping Caper had taken place the charity fabric then had to make it's way from Korea to the USA and then to the Peace by Piece Quilters stash so it could be made into comfort quilts. 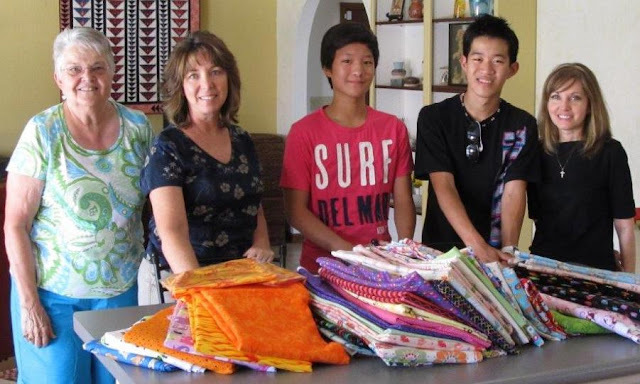 So the ring leader in Korea, Jane's daughter Elizabeth, with her sons DJ and Danny loaded the 154 yards of fabric into their suitcases and began the next phase in their generous project. The flight alone takes about 14 hours. We all know anytime a person (or fabric) flies the effort includes a few hours of preflight time along with layover hours and then post flight time, sooo this was a major investment of time. Once in Arizona the three of them, along with Jane, personally delivered the fabric to the location where the Peace by Piece fabric stash is housed where it was welcomed, fondled, and adored by all. All 154 yards will be on display at the next Peace by Piece Quilters bee to be held on August 1, 2013. I am sure at that time it will again be fondled and adored by all who are present. As little bits and pieces of these cute, FUN, and child friendly fabrics begin to be sewn into comfort quilts all of the Peace by Piece volunteers will be reminded of this International shopping adventure and the generosity of people like Jane and her husband Sam, Elizabeth and her husband, along with DJ and Danny. The mission of the Peace by Piece quilters continues to become a reality because of generous and warm hearted people who not only donate fabric but also time, talent and dedication to the tasks involved in making comfort quilts for the many children in need of something to hang onto during difficult times in their young lives.